Not really. Nobody will care if he's putting up 100 yard games. If he's sucking then we'll trash him no matter what he does or doesn't do on social media. I'm sorry but I'm active on Twitter and on this forum and this is not true. I'll just leave this alone for now until the regular season so we can all continue to be excited about this pic. He could be the next Marshawn or the next Trent Richardson, just never know. IMO Richardson's biggest problem was that his vision sucked. He was mostly a system runner. He had great balance, pad level, burst, and agility and as long as you told him exactly where the hole would be he would hit it like a freight train and was hard to stop. But once he was out of that scheme and asked to do more "find the hole and hit it" zone based sort of stuff in the NFL he was lost. I remember watching him play for the Browns and Colts and seeing him many times literally ignore wide open creases on one side or the other and run right into the teeth of the D line where there was no opening. The only reason he had so many TDs his rookie year with such an awful YPA is how incredibly physical he was as a runner. I really don't see the same issues with Guice. You can watch his tape and see him finding holes on his own, choosing between one crease or the other (and finding ones that were almost invisible to anyone else because they were so subtle), setting up his blocks, manipulating defenders with press cuts, etc. Of course I could be wrong, but we'll see. That was Clinton Portis biggest thing about Guice, the dude was great at setting up his blocks and can make something out of nothing if necessary. And you need multiple defenders to take him down. He has the vision to see a small crease or make the crease on his own by shoving defenders out of the way. Portis take is that there are a ton of situations like this that happen in the NFL where you have to make something out of nothing. And that's rarely a challenge in college where you often have a good crease to run through. So in Portis' eyes the RBs that worry him as to transitioning to the NFL are the ones who are more or less used to runs that are easily set up for them. Guice was the guy the opponents gamed planned for where Guice faced stacked boxes and had to make due. So in Portis' eyes the RBs that worry him as to transitioning to the NFL are the ones who are more or less used to runs that are easily set up for them. Sounds like Samaje Perine honestly. Love the Guice pick. Dynamic runner with some serious power and burst. We've been lacking that for a while now, and focusing on lower tier guys just hasn't panned out for us. Here's hoping we have a new workhorse. This will actually be an issue with a part of this fanbase. Not now in the "honeymoon" stage with this kid but trust me it's coming. It will definitely come, if he starts showing signs exhibiting some of the traits that were mentioned in the negative report(s). It has happened with every great player (or a player that had a great season or two) we've had under Snyders tenure that wasnt bulletproof . This town and fanbase would eat him alive. Couldn't even handle people tweeting, and outlets and beat writers ran articles day and night, leaking "hearsay" stories (that I can guarantee you some of the same people here that don't give this Guide stuff any credence whatsoever, practically jumped into the arms of, then) on the same level as this. 100 yd games would absolutely not solve any of it, because the town and fans feed off of drama, and it would yet again be split down the middle, like everything else. So far so good, though. I hope he has a great career here. Agreed - and a PERFECT non-Redskin example is clearly Trent Richardson. If you haven't seen this yet, please be sure to watch it. It will definitely make you root for this kid. Chris Blair voice for LSU just on Galidi. One of the nicest guys you can be around, motivational guy in the locker room, teammates love him. Was working to be the best pass blocker he can be. Works hard. Dedicated to his craft in every way. Workout hound, studies, etc. Only guy to have three 250 yard plus games in the SEC. He can shift quickly and hit full speed at a remarkable pace. Can run right through you if he has to. He advised the two games of his to watch is Texas AM & Arkansas 2016, you can see everything he has. This one a bit more fun though. 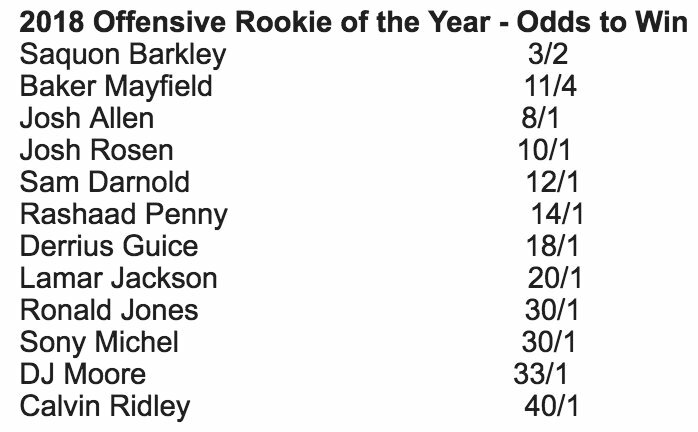 Guice 18/1 to win Rookie of the Year. Actually kinda like that for a flyer. This young man has the talent to elevate the entire team! He must be game-planned for which will make everyone's job on the offense a little easier which, in turn, will give the defense a little more rest on the sideline. Guice could inspire the entire fan base and team with his electric running style! If he can stay healthy (physically and mentally) and motivated, watch out! Seems like the kind of kid that does not make a good first impression on people but once you get to know them you realize they are a good person that's a little rough around the edges. Never a good idea to judge a book by the cover, I guess. I'd take those odds. I think Gruden has been dieing for a back like this. I know we're in that post-draft lull so any and everything gets nitpicked down to the atomic level, and yeah, I do it too because there's not much else happening yet, but this kid! He needs to just be himself, tweet or techno-yak however he wants but man up and do the work to be a pro. There will be some that give him **** because....well, whyever, but he needs to shrug it off and just be. He doesn't need everyone to love him, hell, he shouldn't want that. Be true to yourself and let people love ya, hate ya, ignore ya, whatever and just roll on. I personally kinda like that he's a life support system for a mouth. Kid hasn't been in trouble and if that's the worst thing people can fire atcha then **** 'em if they can't take a joke. Interesting point made in this article - a lot of the reporters making noise about Guice's character have no history of reporting on him at all. The one who has the most history of reporting on Guice (a guy from Baton Rouge who has been reporting on him since High School) says it's totally unfounded and Guice is a good dude. "When a 10-year old girl asked for an autographed football by Guice for Christmas, he not only granted her request but delivered it to her home in person on Christmas Eve and spent some time with the family." LOL. Just saw a comment on FB saying that just because Guice wore his redskins cap backwards during introductory press conference last weekend, it means he’s disrespectful....ok then. ??? stupidest thing I’ve read and it’s not even 10!!! Guice as a prospect on tape is amazing, getting him at 59 is amazing. Sure we might not know what some teams know, or how he's behaving in meetings, but what we do know is that NOTHING negative about his character came out yet. Actually, the Eagles denied any altercation, TMZ came out saying they have nothing. Society nowadays is just out to bash people for things they have no clue about. Now he might bust and be a big headache, but no one knows that. He likes video games too much? You know what stay home, play video games all day, show up to meeting and practice on time and go out on Sundays and play up to your abilities... rather have him playing video games than being out partying all night. Some people didn't like Clinton too much, ST21 had character "concerns" I wouldn't trade either one away for their character or behavior. Portis is a good comp for Guice. He was a character and a bit eccentric, but never got into any legal trouble and always brought it on gamedays.